The closest you’ll get to a switchblade without breaking the law, the Schrade OTF Assisted Opening Pocket Knife fires its razor sharp spear point blade out the front at lightning speed. It’s an impressive, dramatic spectacle that gives you the quickest possible one-handed access to your blade when you need it most - self defense, cutting fishing line from an overstressed rod harness, severing parachute cord and countless other emergencies. If you’re trapped in a wrecked car or burning building, use the integrated glass breaker to save yourself and others. Its lightweight yet tough construction and ease of carry - especially with the built-in pocket clip - make the Schrade OTF a perfect “go-to” pocket knife - suited for most day to day cutting jobs. Like a switchblade, the Schrade OTF’s 3” titanium coated 4116 stainless steel blade ejects straight out of the knife handle using a trigger and spring mechanism. But it does so at a less-than-deadly force, distinguishing it from its illegal counterparts. 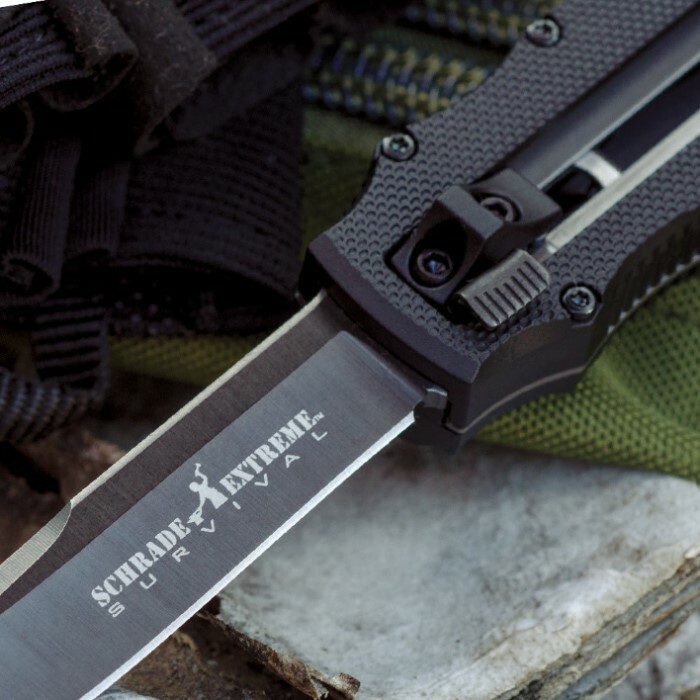 As a further precaution, the Schrade OTF includes a safety switch to prevent accidental discharge, so you can enjoy peace of mind no matter where you take it or how you carry it - pants pocket, belt or even hung from a lanyard. The durable, slip resistant Zytel handle thwarts cutting blunders and unintentional injuries. Best of all, using the Schrade OTF is just plain fun. Try it once, and you'll be hooked!